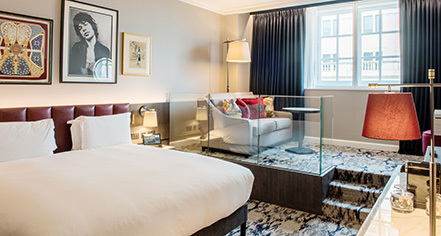 Guests staying at The Trafalgar St. James London, Curio Collection by Hilton will be greeted with 131 stylish guestrooms and suites. The Trafalgar have anticipated all that might be needed for a comfortable and luxurious overnight stay. Charming details in these boutique rooms include iconic books, wall art, plush beds, luxurious hypo-allergenic bedding, flat panel televisions with cable service, and lavish bathrobes and slippers. 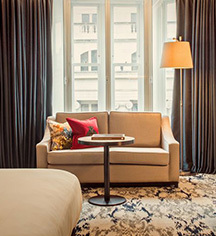 The suites at The Trafalgar include spacious bedrooms, separate living areas, expansive views of Trafalgar Square, daily newspapers, and some feature a double sofa bed. The Landseer, Railton, and Barry Suites are each named after historic contributors to Trafalgar Square itself, and feature a charming view of the landmark they’re named after. These luxury accommodations were designed with comfort in mind, and delivers.